Mikael Nalbandian (Armenian: Միքայել Նալբանդյան; 14 November [O.S. 2 November] 1829 – 12 April [O.S. 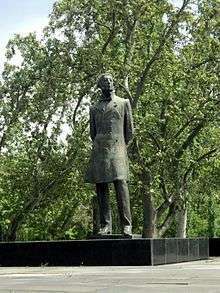 31 March] 1866) was an Armenian writer, a major figure in 19th-century Armenian literature. The lyrics of "Mer Hayrenik", Armenia's national anthem, are based on the lyrics of one of his poems, Song of an Italian Girl. Born in New Nakhichevan (current Rostov-on-Don area) in a family of a handicraftsman. Largely self-educated, Nalbandian initially pursued priesthood, but left it soon after, studied medicine briefly at Moscow University (1854–58) and finally succeeded in collaborating with Stepanos Nazaryan in founding of an influential periodical, Aurora Borealis (Hyusisapayl). 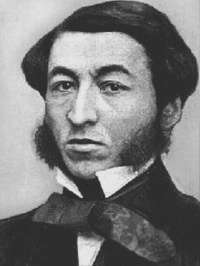 In the years of revolutionary situation in Russia 1859–1861, Nalbandyan was one of the first of the Armenian writers to take the positions of revolutionary democracy under the influence of propaganda by Kolokol (Bell) and Sovremennik (Contemporary) magazines. He traveled widely throughout Europe: Warsaw, Berlin, Paris, London and Constantinople, as well as to India. In Constantinople, Nalbandyan created a secret revolutionary society named Party of the Young around an Armenian magazine Meghu (Bee). In London, he became close friends with Alexander Herzen, N.P. Ogarev, and M.A. Bakunin, as well as with N.A. Serno-Solovyevich and others, participated in discussing the project of an appeal article What the People Need (a program of the soon-to-be Land and Freedom organization). In a pamphlet Two Lines (1861), announced his political credo – to dedicate his life to the idea of people's liberation. In his main journalistic work Agriculture as the Right Way (1862), Nalbandyan criticized harshly the peasantry reform of 1861, even though he did it from the positions of community socialism. He saw a peasant revolution as the only solution for post-reform Russia. Upon return to Russia, his passionate activities led to his arrest and imprisonment in St. Petersburg in July 1862. He was imprisoned in the Alexeyevsky ravelin of Petropavlovskaya fortress. Having been accused of inciting anti-government sentiments with the distribution of propagandist literature, he was eventually exiled (in 1865) to Kamyshin, a remote area over 500 miles southeast of Moscow on the west bank of the Volga in the province of Saratov. He died of tuberculosis in prison a year later. It was forbidden in Russia to possess a picture of Nalbandian; but portraits of him, with his poem, "Liberty," printed in the margins, were circulated secretly. Reform and renewal are the pinnacles of Nalbandian's literary legacy. His writing was influenced by the leading journalists that he encountered throughout his extensive travels. Nalbandian dealt with the issues of philosophy, economics, linguistics, and pedagogy. 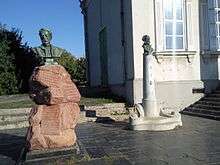 Was a follower of anthropologic materialism of Ludwig Andreas Feuerbach and Nikolai Chernyshevsky and tireless propagator of natural sciences. Nalbandian's philosophy is an important state in the history of Armenian social thought. In his practical revolutionary activities, he tried to tie democratic powers of the Armenian people with the Russian liberation movement. Nalbandian is also the initiator of critical realism in Armenian literature. Nalbandian was greatly admired for his efforts in the movement towards creating a national literature that would realistically reflect the aspirations of the Armenian people. In A Reference Guide to Modern Armenian Literature, Professor of Armenian language and literature at the University of Michigan Kevork B. Bardarkjian writes, "Nalbandian attracted attention as an outspoken publicist... whose lively and bold style, at times crude and arrogant, was almost invariably laced with irony ... In both his literary and journalistic pieces, Nalbandian emerges as an unrelenting champion of freedom and equality; a fearless opponent of despotism, imperialism, and serfdom; an interpreter of human life from materialistic positions; a tireless propagandist of enlightenment, science; and scientific approach; a believer in agriculture as the key to prosperity and independence;..." History has labeled him a Revolutionary Democrat. His poem, "Song of the Italian Girl" brought him lasting fame. It is believed, according to Bardakjian's sources, that it was borrowed and with some changes in wording was adopted as the current national anthem of Armenia (Mer Hayrenik). Much like Khachatur Abovian, Nalbandian struggled for the introduction of the new Armenian literary language Ashkharabar instead of the traditional language of Grabar, for which he was ostracized by clerics and reactionaries. Translated poems of Alexander Pushkin, Mikhail Lermontov, Heinrich Heine, and other poets. Nalbandian is buried in the Holy Cross Armenian Monastery (Sourp Khatch) in Nakhichevan-on-Don where he was born. Bardarkjian, Kevork B. (ed.) (2000). A Reference Guide to Modern Armenian Literature. Wayne State University Press. ISBN 0-8143-2747-8. Great Soviet encyclopedia, 3d edition. – Moscow, 1970–77. Wikimedia Commons has media related to Mikael Nalbandian.